The latest issue of Southern Living has a big Iron Bowl feature, because college football rivalry is as southern as heat and stuff. The article starts and ends with a heartwarming story of an Alabama fan’s daughter who enrolled at Auburn because she was determined to not let her parents’ failings determine her destiny. Photo-wise, there are the usual Tide-Tigers juxtapositions: Band members, cheerleaders, mascots. 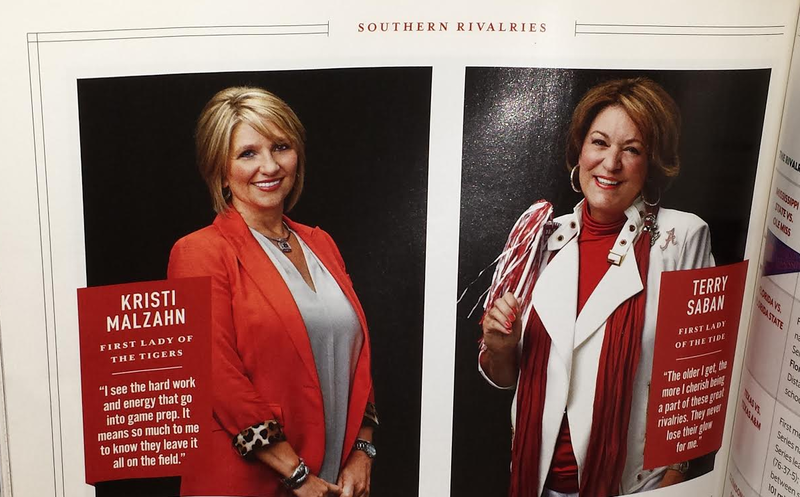 But the last spread—it is Southern Living after all—is of the head coaches’ wives, Kristi Malzahn and her Crimson counterpart Terry Saban. 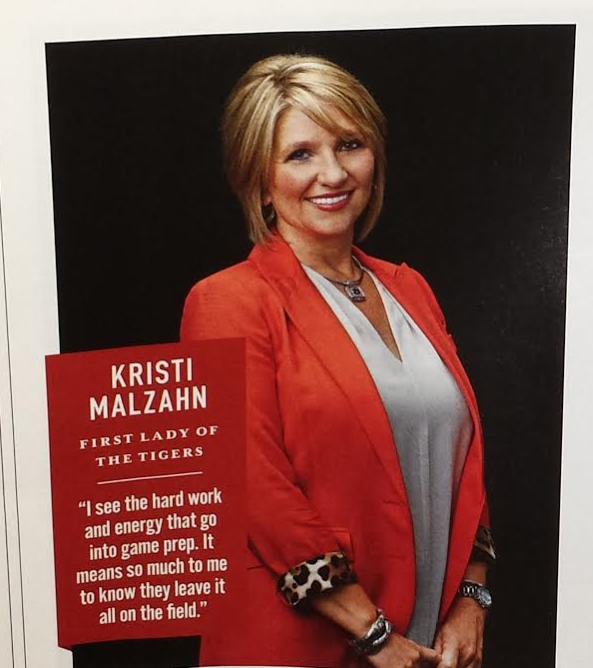 And I just have to say that Kristi Malzahn is every bit the fetching football fashionista the magazine editors no doubt hoped she would be. Like Pam Halpert’s mockup for Dunder-Mifflin Infinity, her wardrobe’s loyalties are both clear and subtle at the same time. Trivia Time: Auburn was actually the main focus of what I’m pretty sure was the magazine’s first football-centric feature, which appeared in the September 1968 edition. The cover is fabulous. Related: Kristi Malzahn’s amazing orange and blue Preakness hat. Terry Saban’s quote (“rivalries?”) is almost as if she’s having trouble remembering what school her husband currently works for. Someone should tell Terry Saban that Shawn Michaels wants his jacket back.